When struck, a bell -- essentially a piece of metal comprised of a given thickness and size -- will emanate a specific frequency. A tubular bell is a bell made from a long cylindrical tube and is similar to a wind chime, glockenspiel or xylophone. This type of bell is usually hung suspended from one end and struck with a mallet in order to make a tone. Making a tubular bell requires some guess work, as the vibrational quality of a metal pipe can be affected by many factors. Select the material for your tubular bell. The material will affect the sound and size of your bell. Steel and copper, for instance, are both popular materials for tubular bells. For ease, choose a standard material and size. Either .035 inch thick copper tubing or 0.5 inch thick electrical metallic tubing work well. Decide which note you want your bell to play. This will determine the length of the finished tubular bell. The lower the note, the longer the bell will have to be. For instance, a D sounding at 11.7461 Hz that is made in copper must be 11.69 inches long. 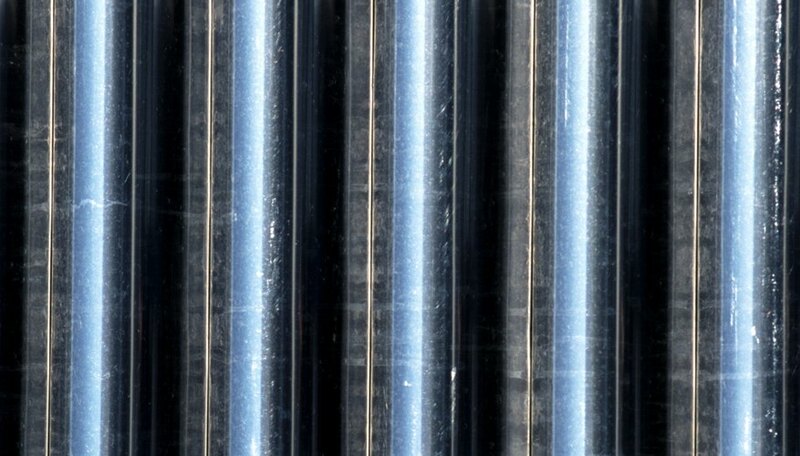 The same note made with electrical metallic tubing must be 11.9375 inches long. Measure and mark the desired length on the pipe. Place the pipe on the pipe cutter and make the cut. Cut slightly longer than the mark at first. Tuning a tubular bell can be a process of trial and error, and if the bell is sharp -- meaning it is too short -- nothing can be done. If the bell is flat -- meaning that it is too long -- it can always be cut shorter. Measure the final length of the pipe. Divide the number by 100. Multiply the answer by 22.5. Measure this length in inches from the location that you wish to be the top of the bell. To hang a tubular bell, the hole cut for the hanging string must be located approximately 22.5 percent of the way from the top of the pipe. Suspending the pipe from this node will allow the bell to ring without having the vibrations affected by the string. Tie a piece of string securely at this location. Turn on the pitch finder and tap the bell lightly with a mallet while standing near the tuner. Hold the string, not the bell. If the bell registers as flat on the tuner, shave off a very small piece of metal from the end with a pipe cutter. Test again until the tone is perfectly on pitch. Drill a hole from one side of the pipe though to the other on the location marked as 22.5 percent down from the top. A hole drilled in this location will not affect the tonal quality of the bell. The size of the actual hole is not important; it should be big enough to accommodate the string but not so big that it weakens the structure of the metal tube. Tie the string to the hanger from which you wish to suspend your tubular bell. What your bell is suspended from is up to you. If you are only making one bell, you may wish to hold the bell by the string with one hand while striking it with a mallet held in the other. If the bell is part of your percussion kit, you could hang it from a mic stand or even construct a frame out of wood to hang it from. Refer to the links in the Resources section for the proper lengths to cut copper and electrical metallic tubing for notes other than D.
Darby Stevenson began writing in 1997 for his high-school newspaper, the "Alsea Valley Voice," which won him statewide awards for Best Feature Article and Best Personality Interview. He holds a Bachelor of Arts in international studies and a Bachelor of Arts in religious studies from the University of Oregon. What Materials Are Used to Make a Trombone? How Much Is a 1943 Steel War Penny Worth?